This actually went to a 8th grade middle class. The teacher, my daughter has organized her classroom to create a more relaxing atmosphere for her students. They love it! 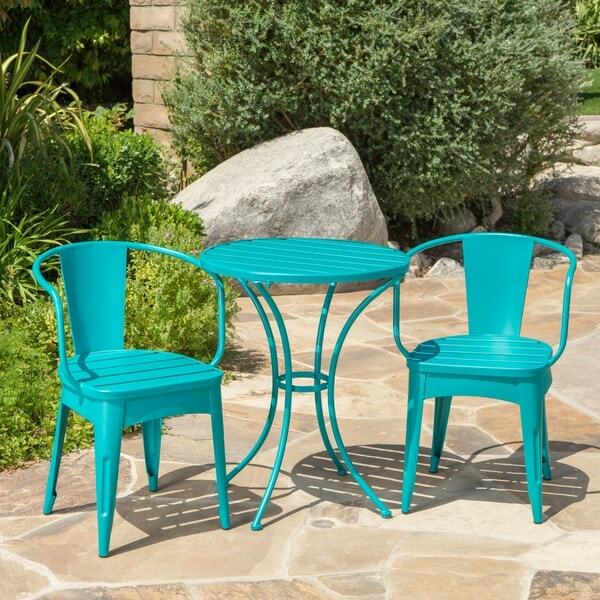 Cheerful and lighthearted in its whimsical styling the Colmar outdoor 3-piece bistro set will entice any passerby to pause for a while and just be. 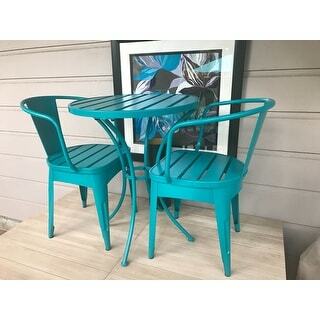 I was excited to find this bistro set after searching everywhere for something reasonably priced that fit my style. I love the look of the rustic chairs (popular right now) and the round dining table for my small apartment balcony. I ordered the black with silver version. There isn't a whole lot of silver showing through, but the metal is a bit distressed and has imperfections. 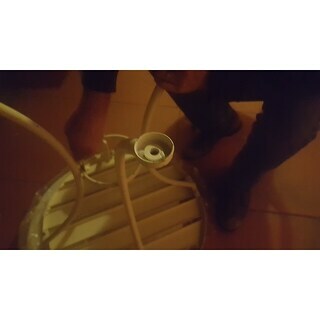 The chairs were quite easy to put together with only three screws. One of the chairs is a bit wobbly, I think I will just have to deal. The table had a few more screws and instructions, and is a bit more wobbly, which is disappointing but I think one of the legs was a bit uneven to begin with. Over so far I am happy with my purchase and the look of the set. I will update my review if I start to see rust or other issues. Perfect for my deck! Matt color is great and it is easy to assemble. A comfortable seat for my morning coffee! This little bistro is so beautiful. The color is so bold. I bought it because my patio furniture is black, but I was using pillows to bring color. Adding the bistro has made a big difference. My deck looks colorful and fun. I recommend this bistro to anyone that wants to add fun and color to their outdoor living space. I found this set to be perfect for my 9 x 7ft porch. However, one of the feet pads on the table is missing! Any way I could get a replacement? I would rather not return the set! I love this set. Arrived promptly. It was packed very securely. Super easy assembly. Only 14 screws. The finish is wonderful and the matte teal is gorgeous. Another winner!! A little wonky once it's assembled. The pieces dont fit properly. Overall the look is cute. don't place outside. It will rust. Its covered in rust and it's only been outdoors for a few weeks. 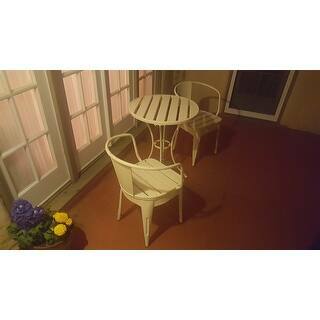 This is a cute bistro set that works well for a small space. It seemed a little cheap when I was putting it together but that’s to be expected. It was very easy to assemble with one person and included all the parts, plus extras. I like the color and can’t wait to finish it with a plant and some pillows. Received our bistro set in a timely fashion and 10 minutes after opening the box it was assembled. It was that easy to put together! I love the way the distressed features of the set goes well with our wicker furniture set that is on the porch too. I wanted a cheerful bistro set &amp; this filled the bill. Easy to put together. Live the slatted top. I can put a lamp cord thru &amp; plug in decorative lamp! I purchased this in white. It is lightly distressed and easy to assemble. I love it! It's sturdy and charming and perfect for enjoying a coffee on the patio. Love this set! Easy to put together, and looks awesome! Perfect for a small area indoors or out! Chipped paint all over. Horrible. Nice and sturdy for the price but not the most comfortable chairs. I need to put cushions on them. These were outside in direct sunlight all summer by the pool in Colorado. I gave only 3 stars because they faded a lot in just one season. A positive is that they are very sturdy. This is a very Nice set. It is also Easy to set up. It seems to hold up well in the weather. Also, the colors have held up very well in the weather. This is large enough to sit two adults comfortably, but yet small enough that it works well on my covered front entrance. We got the darker color for that "farm house look". This was a gift and our daughter loved it. Easy to put together. Purchased for my daughters new condo.They have a small sitting area and garden outside the back of building. As soon as we set up and cleaned up the garden, all the neighbors came by to say how pretty it looked. "the color is described as black with silver. What part is silver?" "How much weight do the chairs hold ?" Hello MaryannM, we do not currently weight test items. We apologize for any inconvenience. Thank you for shopping with us. "The photos show the black set in 2 different styles. One set has slatted seats and tabletop, and second one is more solid with a leaf design. Which style would I get if I ordered this product?" Hello nf1521, the set has slats. Thank you for shopping with us. Wanted an item with chairs with arms that would also withstand the elements. Price and appearance. 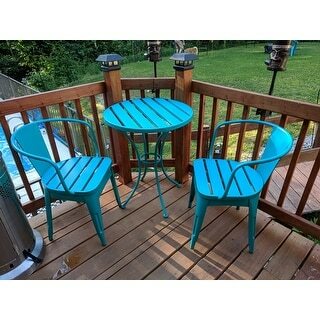 Best bistro set I could find for under $150.